Weekly Photo Challenge: Gone, But Not Forgotten | Oh, the Places We See . . . 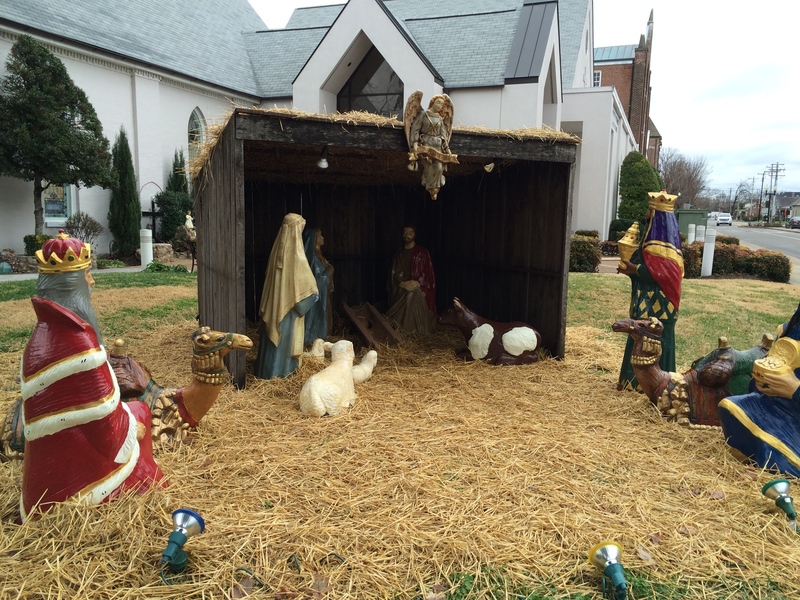 While driving through one of our favorite Middle Tennessee towns — Franklin — we paused near the entrance of St. Philip Catholic Church to take a closer look at the Nativity laid out beautifully on the front lawn. It was old-world, if you will — beautiful figures in colorful clothing, animals gathered ’round, all focused on the manger scene. But as we moved in for a closer look, we noticed something missing. Where is Baby Jesus? we wondered. Just as we were looked into the stable, a woman jogging by stopped and said, Are you from out of town? Do you know the story of this Nativity? We admitted that we were from out of town and no, we didn’t know the story. She continued. I’ve lived here all my life. Grew up with this lovely old Nativity and adore it still. 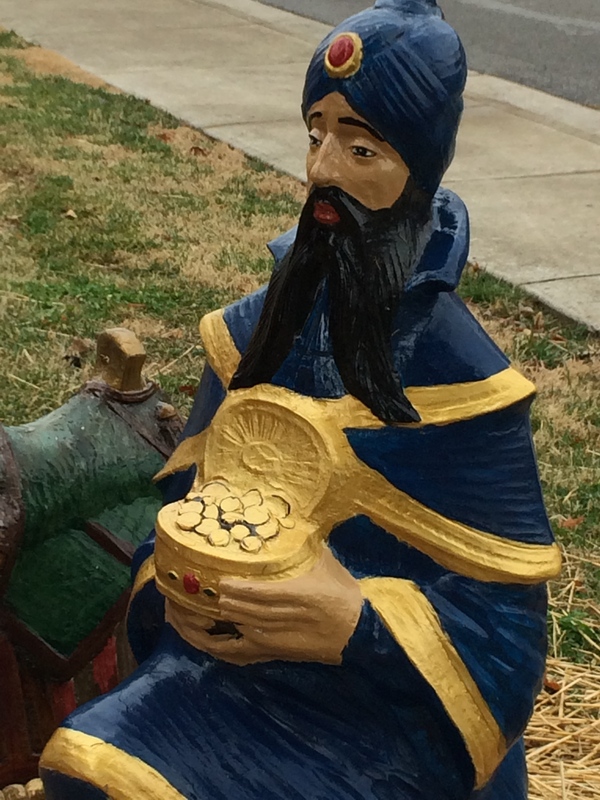 But a few years back someone stole the Baby Jesus. The church people got together and decided not to replace Him. Said they didn’t want to put another one in just so someone could remove one after another. And so, the manger is empty. I replied that I was sorry to hear about the theft, but a friend of mine had a different take on this. My friend, I said, actually purchased a Nativity from a store that had marked the set way down because there was no Baby Jesus. The lady jogger in Franklin loved the story. For her and for my friend who bought the Nativity missing the central figure, the Baby Jesus was gone but definitely not forgotten. For more entries in this week’s WordPress Weekly Photo Challenge: Gone But Not Forgotten, click here. This entry was posted in Photography, Tennessee, Travel, Weekly Photo Challenge and tagged Baby Jesus, Franklin, manger, Nativity, postaday, St. Philip Catholic Church, Tennessee. Bookmark the permalink. I like the message of the empty manger! Thanks for reading the post and commenting. I, too, love the message. And I couldn’t resist sharing the story related to me by a friend with a total stranger. It’s interesting what sticks with me, and this story did. Merry Christmas! You may be right about that serious karmic payback. I’d hate to stand before the Pearly Gates and admit to stealing the Baby Jesus, but there are probably worse crimes. Not sure why people want to deface property that obviously brings so much joy to so many. Best wishes for happy holidays no matter where you are spending them. 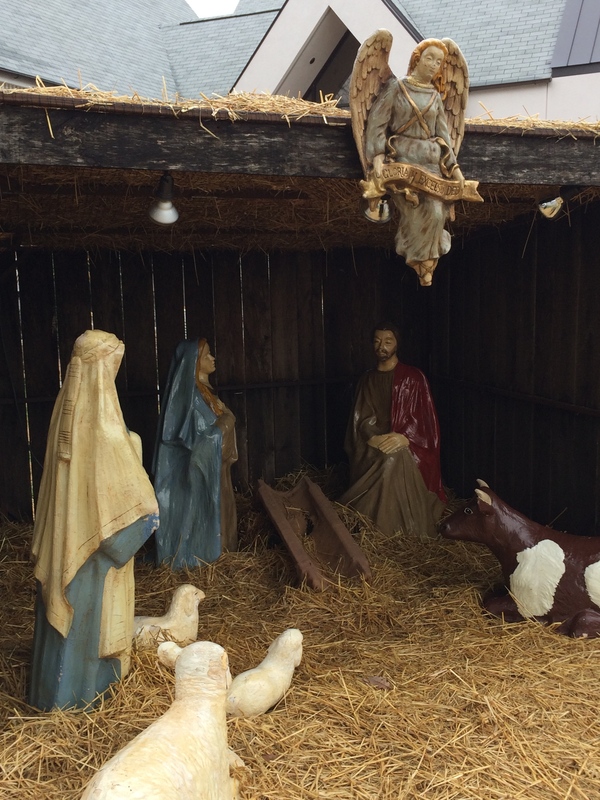 Great little story … I’m not a huge nativity scene person, but I’m glad I read on because the message was really nice! Thanks so much for reading to the end. It is a sweet story. One that I’ve never forgotten. It’s all in your perspective about things that determine the value, I suppose. Best wishes for happy holidays! Thanks so much! It was one of those serendipitous moments, I guess. That jogger just happened by right when we were there. Thanks for reading/commenting.